Outreach Dogs in the Library! 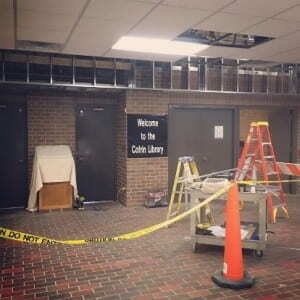 The second floor (or Plaza level) of the library is being renovated! The Writing Center & Learning Center will move their services to where International Ed used to be and study spaces will be available where Adult Degree & Outreach were. Looking for International Education and Continuing Education & Community Engagement? Their offices are now on the Concourse level between the hall to the Library elevators and The Garden. Follow the library on social media to stay up to date with the construction progress.